This morning I paid a visit to Yarner Wood, an area of ancient oak and beech woodland on the eastern side of Dartmoor National Park. 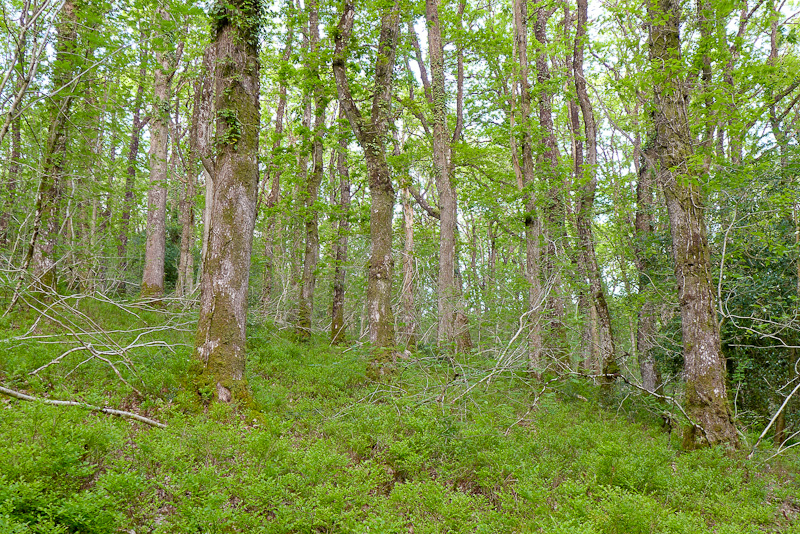 I was planning to record Pied Flycatchers, which a few weeks ago were singing all through the ancient oak woodland. Unfortunately it turned out I’d left it too late in the season, as the flycatchers have now all established their territories and settled down to raise young. In the two hours I was in the wood I didn’t hear a single burst of flycatcher song. Luckily Yarner Wood has another speciality species which was still very much in evidence, the Wood Warbler (Phylloscopus sibilatrix). They tend to sing from high up in the canopy, and move around continuously while singing, so they’re not easy birds to record. After walking around for a while I discovered one singing from a tree on a fairly steep slope which meant that, by climbing a little further up, I could get closer to the level of the bird. The song consists of two phrases. The most commonly repeated one is an accelerating trill that is often compared to the sound a spinning coin makes as it comes to rest. There is also a descending series of whistled notes which is far more melodic but less often heard – the ratio of trills to whistles is something like 6:1. Equipment used was a Sony PCM-D50 recorder and a pair of MiniPiP microphones in a miniature boundary array.